The Atacama Desert - one of the driest, most barren places on planet Earth - is an unlikely muse. It's the kind of place loved best by patriots and poets, the kind of people who can see beauty and mystery and metaphor where others only see a unending pile of rocks and dirt. Noted Chilean documentarian Patricio Guzmán is definitely the former. In Nostalgia for the Light he travels to the desert to see if he can learn what it has to teach - and reveals its past and present uses as an ideal laboratory for history and science, not to mention oppression and murder. Juxtaposing the work of astronomers that have flocked to the Atacama (so dry that the night sky is described as "transparent") with the desert's infamy as a dumping ground for Chileans murdered by the Pinochet dictatorship of the 1970s and 80s, Guzman wants to rescue the memories of his beloved home country, even the terrible ones. As with any nation scarred by great atrocity, says a desert historian, there's a tendency towards forgetfulness. The bloody Chile of then seems so far removed from the constitutional Chile of now. How are we to feel anything but heartbreak and pity for the sisters and mothers of the "disappeared" who still search for the remains of their loved ones underneath the salty soil? More importantly, how are we supposed to care about anything else presented in the film? The Pinochet killings are Nostalgia's knockout punch, but Guzmán doesn't time the blow for maximum effect. The attempts to weave history and astronomy with the remnants of Chile's turbulent past are muddled at best. Even the film's subjects comment on its lack of cohesion - from both the astronomers' and the grave hunters' remarks, they seem mostly unaware of each others' efforts. Should they be? The scientists speak excitedly and abstractly about relativity; they are literally monitoring our universe as it expands. The women, conversely, seek closure and are unlikely to find it, except in bone fragments and a few teeth, perhaps. 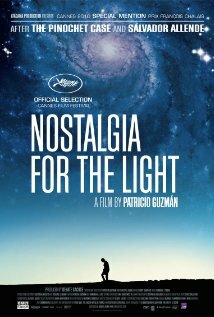 Nostalgia takes a heady mix of complex topics that could probably sustain two separate films and mercilessly trims them to fit Guzmán's grand unifying theory of Chile (and to make time for his long, fetishistic close-ups of moving machinery and dusty skeletons). There is good material on either side of this story, but it's too inelegant to be scientific and too detached to be political. The result is a documentary as dry and impenetrable as the desert itself.